When Ben visited us this christmas gave me a copy of the beautiful Tartine bread book. Since then i’ve been learning to grow my own yeast and making experimental sour dough with varying results. I’ve been growing my starter, dubbed Eric/B, for almost a month without killing him and produced 4 good loaves using the basic Tartine recipe. An off-cut of of Eric has even made his way to South London in the form Eric/B1, a gift to our our newest munchmun.ch contributor, Kriss. A plastic tub to store the starter in. I’m using a supermarket humus-type pot. Your flour mix, mine is 50% wholewheat, 50% white bread flour. Make a large batch of it up so you don’t need to mix it each time. First question, what time to feed? I’ve been following the Tartine suggestion of doing it in the morning, but it seems theres no hard or fast rules. Find a time that works for you and stick with it, the most important thing is a consistant time. You’re “training” the yeast to rise and fall in cycle in preparation of using it to bake with. Next, how does feeding work? The short version; remove 80% of the starter and replace the flour/water. This prevents the culture becoming too sour and vinegary while still developing the culture for baking with. Take your existing yeast culture and clean off any dried bits round the top of the pot, or peel of any heavy crust that may have formed. Give the remaining mixture a good stir to get an even consistency, then remove all but 40g and reset your scales. 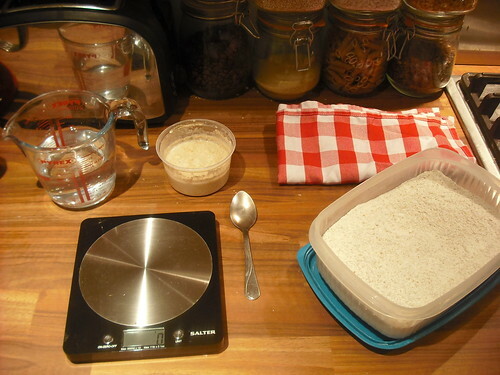 Add 75g of your flour mixture and 75g of water and mix carefully. If you have a small pot then this will probably make a bit of a mess. Pop the cloth over the top of the pot and put it somewhere with a reasonably warm consistant temperature. You can then decide how long you want to wait till feeding it again. Personally i’m feeding Eric once every 2 days, rather than the once a day I was doing, as i’m not actively baking at the moment and he was a lot of time/flour to feed everyday. I’ll be posting some recipes/pictures from my recent sough dough experiments soon, so once you have your own stable Eric you can bake with him. I just need to get the knack of it myself first, before I try and teach. This entry was written by David, posted on February 7, 2011 at 11:00 pm, filed under Misc. Bookmark the permalink. Follow any comments here with the RSS feed for this post. Post a comment or leave a trackback: Trackback URL. Pam (sired by Eric, y’see…) has just been fed successfully for the first time. Looking forward to making my first load of sourdough.